social media mistakes create preventable crises – so this is mass communication? We’ve all heard the Twitter horror stories about posting a message you thought was going to your personal account but ended up posted on the corporate account you manage instead. Oopsies. Accounts for a senator & the American Red Cross are infamous for these mistaken tweets. And it seems those tweets posted in haste are never benign messages like “wow what a great a day” — instead they tend to be messages that blow off steam in one way or another. The social scientist in me wonders if there is a correlation between this accidental tweeting and the tweeter’s level of annoyance with the world at that particular moment. Well it happened again, and this time it was the U.S. Navy’s official account that published the mistakenly tweeted comment. And what a splash it made — being covered in the Navy Times blog & Politico (the main source of buzz in the Beltway), among other industry blogs. In a situation like this is is absolutely necessary to admit your mistake, which they quickly did. And in a mild social media crisis like this, humor goes a long way at maintaining a relationship with your stakeholders, which they did. The crisis response was well-handled, but I can’t help but wonder how we’re still having these problems — especially on such big brands. Not only should a social media specialist of all people be extremely cognizant of which account he or she is about to post to, shouldn’t the social media team more than anyone know to NOT post when you’re angry or distracted? The bottom line is even if your response is excellent, controlling the situation to prevent the crisis in the first place is the better tack to take. Quick Disclosure in Case You Forgot: While I used to support the Navy social media team, I haven’t had my hands in their work since early 2011. I am still in the U.S. Navy Reserve and always interested in what is happening with the services & their social media. I have seen this happen several times before. Often times its with businesses on facebook or twitter offering some prize on the hundredth retweet or thousandth like. These mistakes can be very costly to a business. 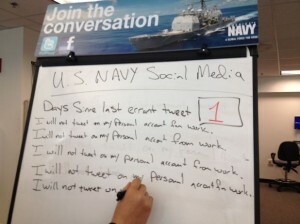 It is interesting to see that even the armed forces and U.S. government can even make mistakes with social networking.